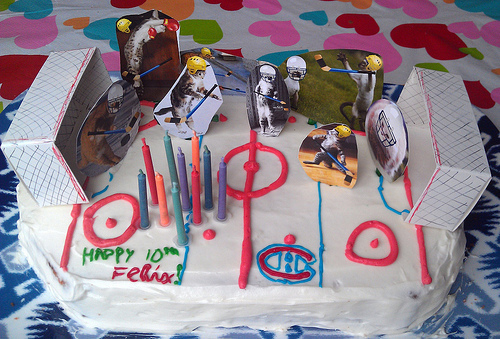 So this year my son turned 10, and he requested a cake that was all sorts of "half-and-half". 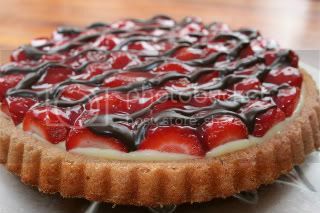 And he wanted strawberry AND chocolate cake as well. I wasn't up for making a layered cake, so I asked if he'd take a strawberry cake with chocolate chips in it - and then found myself having to make something up since I couldn't find anything that matched that description online. The boxed strawberry cake mixes from the store are pretty...meh. So I found a bunch of strawberry cake recipes that called for a white cake mix and a package of Strawberry Jello, or I'd find ones that were totally from scratch that had crushed berries in them but which weren't pink, so I decided to go with something in between since I'm not fond of the boxed white cake mixes and wanted something in between. I am very pleased with this one, because I've never messed with a cake recipe that much before. 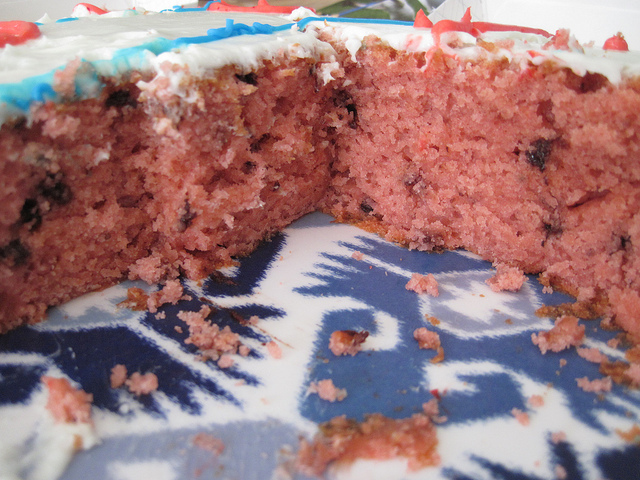 It came out very strawberry flavored, not too sweet, with just the touch of chocolate. 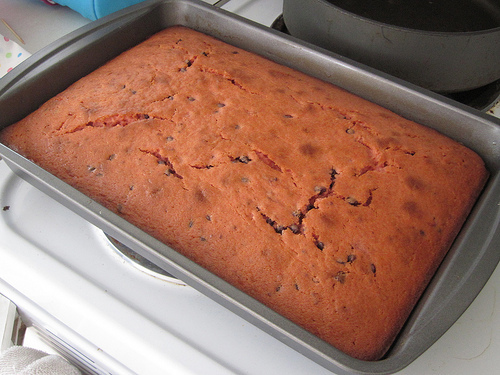 I put some frozen strawberries in a ziplock the day before I made the cake, so they'd thaw before I made it. Then for the cake, the first thing we did was to mash up those berries. 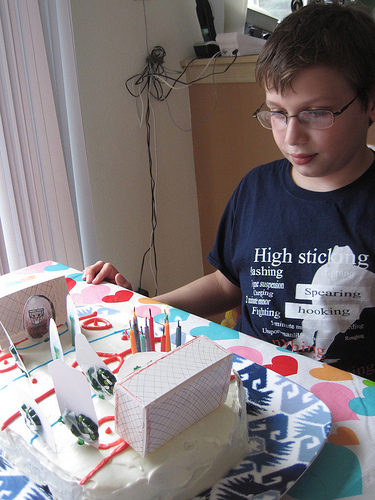 This was a great job for the littlest helper who was excited to help make her brother his special cake. The leftover mashed berries can be thrown in a container and used for smoothies later - bonus! Fold it together and you're going to have some pretty shockingly pink stuff to cook with. Pour it into your pan, having greased the sides with some butter beforehand. Oh - and I discovered an awesome trick which is kind of a "duh" but which had never occurred to me until I ran across it searching for recipes - line the bottom of your pan with parchment paper and your cake will be a snap to pop out of the pan! 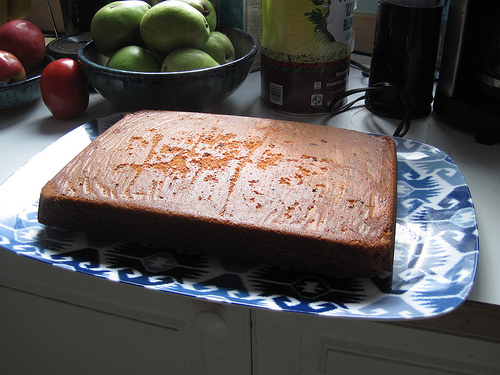 Bake @ 350 for 1/2 hour and then start checking the cake with a toothpick to check when it's ready (toothpick won't come out mushy) - mine took about 40 minutes. 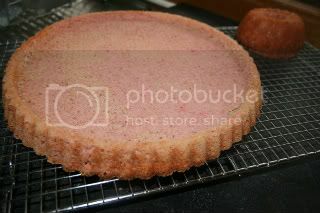 THAT'S A PINK CAKE! Your house should be smelling pretty "strawberry" now. parchment paper, I love you! 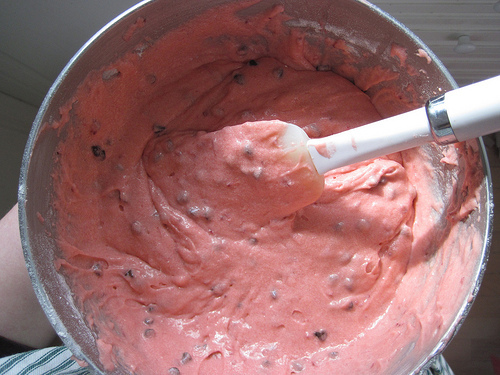 2 cups confectioners' powdered sugar in a mixing bowl, and whip with an electric beater until smooth. 1 cup of heavy whipping cream and beat again until you have a spreadable consistency. Your birthday cake looks stunning you did a fantastic job with the decorating!! 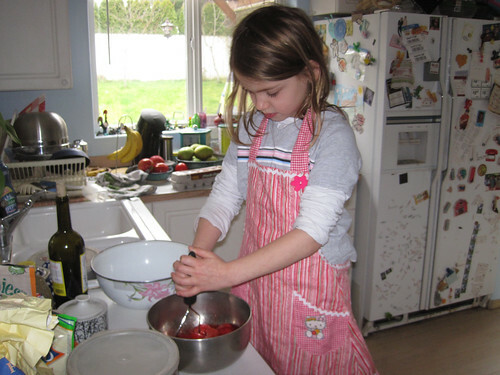 My son also happens to LOVE strawberries and chocolate and I was making him a strawberry glazed flan today for when he comes home from school. I just used your recipe for the flan, it's in the oven and it smells fantastic :) I assumed jello is what we call jelly in Australia, our packets are 85 grams so I hope that was right. Fingers crossed my cake turns out moist like yours. I would guess so too since our boxes are 85 grams as well. Tell us how it turns out! Wow! Do let us know how it came out! Is flan the same as a cake? The meaning of flan I was familiar with is a jelly-like caramel custard type of dessert! It's out of the oven now and WOW it's good! Thanks so much for sharing the recipe, I also made a mini bundt cake so I could taste it :))) Maybe Flan is an Australia word? It's a layer of cake (I normally use Vanilla) topped with egg custard then fresh strawberries and then finished off with a glaze. My son is going to love this cake! I'll post a picture when it's finished so you can see it. woohoo! That's awesome! And can I say how incredible it is that we still havent put the kiddos to bed on his bday and someone else on another continent has already tried the recipe? :D Looking forward to seeing your pics! 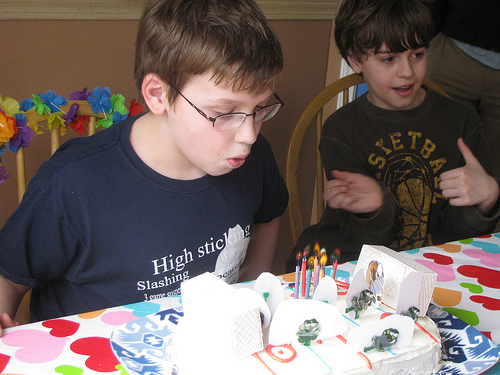 My son loved it....in his words (edited otherwise I'll get banned) This cake is _____ MINT! Hehe mint is teenage Aussie slang for REALLY good! 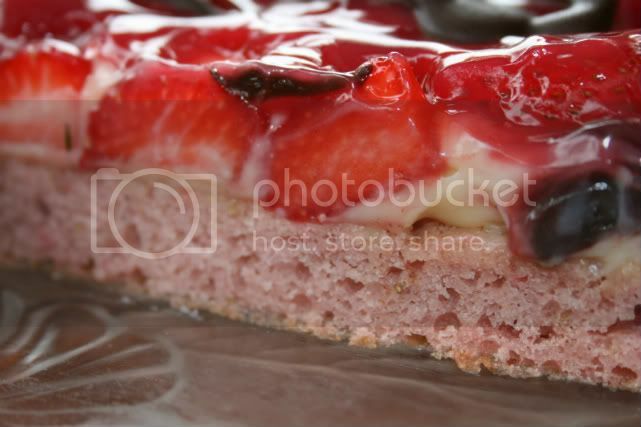 He then said it was the best strawberry flan I have made! The flavours were so much nicer with a strawberry base instead of a vanilla based cake! Thanks for posting your recipe, I'll be making this AGAIN! and I'm glad it turned out "mint" :) Thanks for sharing your photos!